A restaurant cleaning business is an intriguing branch of the cleaning service sector, with many advantages over a more typical cleaning service. More lucrative contracts and more frequent repeat business is the rule in this niche. The flipside is that there are a lot more details to tend to. Health regulations and safety codes strictly apply, and inspections are done on a regular basis. 2. Map out 3-5 restaurants with 15 tables or more in your area, and go speak to the manager/owner (in person, not over the phone). Five restaurants will take you two hours to drive to and visit, if you are by yourself. If a partner accompanies you, the two of you can probably speed up the presentation time, and visit 7-8 restaurants within a 2-hour time frame. 3. Only prospect for business between 2-4pm, Monday through Friday. This is the slow time, and the managers will be more readily available to talk with you during this time. 4. Emphasize that you are a locally owned business. We started as a family business, locally owned and operated. The family business aspect is something a lot of restaurants that we have spoken to really like. 5. Always offer potential clients good advice that they can use. For example, they should try to seat or at least acknowledge their customers within the first minute after entering their restaurant. Studies have shown people tend to get upset after a minute of waiting in a restaurant without being acknowledged. I have over 50 different ideas that could save a restaurant money, which I let the potential client know. 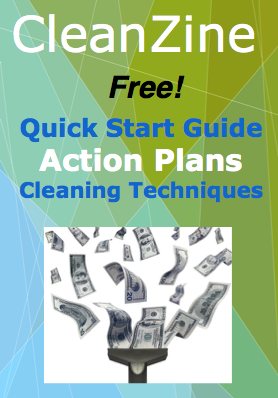 Create a brochure of these money-saving tips and give it to your client for free. 6. Once you start getting contracts, go and speak to the manager every week for the first month or so, to ensure that he or she is satisfied with the job. Check in monthly after that. 7. Use flyers with a business card to attract business. Do not staple the cards to the flyer, as they might throw away the flyer. Use a paper clip to attach the business card to the flyer, and the restaurants are more likely to keep your card. 8. Use good accounting software and keep good records. Payroll is the most costly expense in this business. 9. If you have restaurant cleaning experience, partner with a person who can do the management portion Maybe find a business school graduate who has management experience. Neat and Sweet is a family-run business, where the partner who does the actual cleaning has 10 years of cleaning experience, and the management partner has a bachelor’s degree in management with 15 years of management and entrepreneurial experience. The restaurant-cleaning service sector is an interesting and lucrative profession that has great growth potential, and it may make a profitable startup business for you.